Dr. Neil also offers the activator technique as a low force chiropractic treatment option. The Activator Method Chiropractic Technique (AMCT) uses a unique hand-held Activator Methods® Adjusting Mechanism to give a consistent low-force, high-speed chiropractic adjustment. This is the most gentle adjustment we offer at Superior Spine Care while still providing the benefits of a traditional chiropractic adjustment. This technique is a great option for those who have found adjustments uncomfortable in the past, or for our older patients who are concerned about osteoporosis. It's common for most patients who have not had chiropractic treatment before will begin with this gentle technique for their first few adjustments. How is the Activator Technique Different? 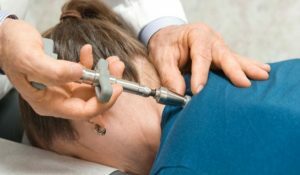 For the adjustment itself, Dr. Neil uses the traditional Activator Adjusting Instrument (AAI) to apply mechanical force to the spine, instead of manually manipulating the spine with his hands, which is done in the Diversified Technique Adjustments and Thompson Chiropractic Technique. Patients consider it a softer chiropractic treatment and those patients made uncomfortable by physical touch typically are put at ease with this method using a device. The device was created by Arlan Fuhr as an alternative to manual manipulation of the spine or extremity joints and is categorized as a mechanical force manual assisted (MFMA) instrument. The benefits of the Activator Method Chiropractic Treatment are comparable to the other chiropractic techniques incorporated by Dr. Neil. The objective of all the chiropractic treatments applied to our patients is to manipulate, or "adjust," the spine in order to relieve pain, decrease discomfort, improve performance, increase range of motion or to treat many common conditions effectively treated with chiropractic care. The most significant benefit of having the Activator Technique available to our patients is that we are able to treat each patient to their level of comfort. If a patient is uncomfortable, or intimidated by one treatment, we can offer a broad choice to make each patient comfortable while still allowing them to benefit from chiropractic treatment and the manipulation of the spine for optimal health.